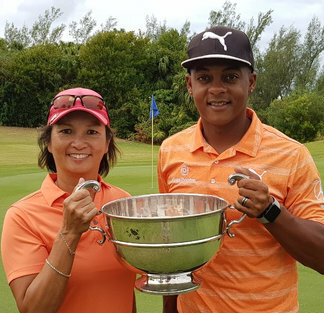 There was an exciting conclusion to the Bermuda Mixed Foursomes Championship in which Jevon Roberts and Liz Carpio took the title with a gross score of 3-under par 51 in the Pinehurst format for a total combined score of 107 at the Turtle Hill Golf Course. Round 1 leaders Wayne and Lesley Balcombe didn’t fare so well and allowed Damian Palanyandi and Katyna Rabain to take 2nd place. Palanyandi and Rabain shot a 1-under par 53, with John Whiley and his partner Irene Foti as well as Randolph Simons and Patricia Morgan both shot 3-over par 57’s.